I love being a Washington DC wedding photographer! This photo is such a great example of what I love about Washington DC weddings. This image was taken at the Willard Intercontinental Hotel, and as you can probably tell, we were in the elevator at the time. The groomsmen had their drinks, and one groomsman in particular was pretty excited about the olives in his buddy's martini! 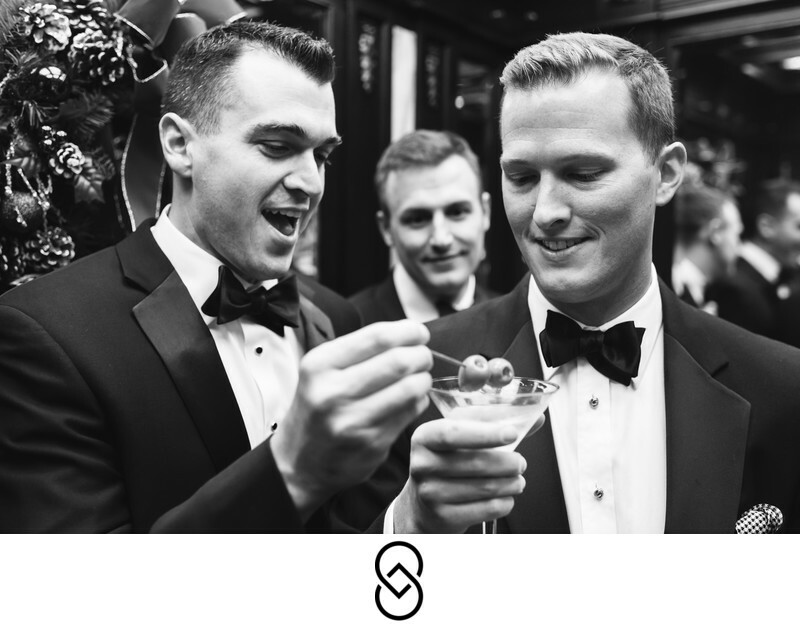 Groomsmen are often hilarious, and the olive thief took his opportunity to steal his friend's martini garnish! This is one in a series which is a pretty hilarious little vignette from the wedding day. I always think it's just as important as a DC wedding photographer to have great photographs of the groom and his groomsmen as it is to photograph the bride and her attendants. The Willard is a beautiful hotel, and I enjoy working there. The rooms are expansive and many of them have beautiful views of the White House. The Willard is a Washington DC institution! Not only is it a great place to get ready, but it also has beautiful ballrooms onsite for those wishing to celebrate their wedding. I have more than a decade of experience as a DC wedding photographer, and I really pride myself on capturing beautiful, authentic moments in a way that will tell the story of your day. I don't like to interfere too much in the natural course of the day, but I will absolutely work with every client to ensure we have a great timeline and have set things up to allow sufficient time to document all aspects of the wedding day. When you're seeking a DC wedding photographer, you should definitely take the time to look carefully at their work as well as meet in person if possible. It's also helpful to request access to some full client galleries so that you can get an accurate sense of what each photographer is delivering to their clients. I edit all the images I provide to my couples to ensure that every image looks beautiful. Location: 1401 Pennsylvania Ave NW, Washington, DC 20004.